"Live" PDA display, updated every 60 seconds. Daily plots and raw data files, including wind roses, are available from July 15, 1981 to yesterday. Solar calendars, are available from July 1981 to the present month. Monthly roses for April 1988 to last month. Seasonal roses for Summer 1988 to last season. Yearly roses for 1989 to last year. Quality assessed data for July 1981 to last month. Monthly reports (ASCII) for July 1981 to last month. Cylinder plots for January 1997 to last month. QCFit plots for January 1997 to last month. Full flag summaries for July 1981 to last month. Flag summary tables for July 1981 to last month. Monthly reports (PDF) for July 1981 to last month. Monthly plots for July 1981 to last month. Yearly data and plots can be generated using statistics extracted from monthly reports. A Sky Image Snapshot of the current sky-conditions, updated every 60 seconds. Total sky images and "cloud analyzed" images (with cloud cover values), every 10 minutes. Percentage of thick and thin cloud cover, every 10 minutes. Percentage of thick and thin cloud cover, since September 26, 2017. Percentage of opaque and total cloud cover included with the BMS "live" and daily time series data stream, every 60 seconds. The SkyCam Image Gallery contains historical snapshots every hour (during the day), are available from September 3, 1999 to May 8, 2017. The Daily SkyCam Animations will animate all the hourly historical snapshots. Several Spectroradiometers have been measuring spectral data, since January 24, 2001, updated every 60 seconds. GPS-based Precipitable Water Vapor (PWV) measurements are available since June 13, 2012, updated every 60 minutes. Aerosol Optical Depth (AOD) measurements are available since June 11, 2013, updated every 24 hours. A Spectrafy SolarSIM-D2+ is providing direct normal spectral models since September 1, 2016, updated every 60 seconds. An EKO MS-300LR Sky Scanner has mapped luminance and irradiance, from June 14, 2000 to October 28, 2002, every 15 minutes. Compute the solar position and/or intensity from time and place using MIDC's Solar Position Calculators. Develop a renewable resource climatology for NREL in Golden, Colorado. Provide outdoor facilities for radiometer calibration and characterizations. Conduct measurement-related research and development in support of the renewable energy conversion technologies. Provide excellent solar access at the South Table Mountain location. Collect continuous research-quality measurements of solar radiation and other surface meteorological parameters. Develop improved methods for outdoor radiometer calibration and characterization traceable to international standards. Coordinate the varied outdoor research data acquisition projects. Provide NREL research programs with access to an outdoor laboratory with optimum instrument mounting platforms, automatic data acquisition systems, and regular operation and maintenance procedures. 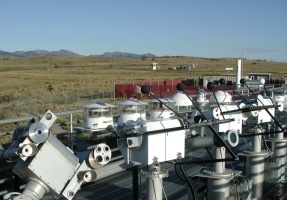 Continued operation of the Baseline Measurement System (1-minute data from over 80 instruments, including pyranometers, pyrheliometers, pyrgeometers, anemometers and other meteorological sensors). Instrument pictures and documentation is available. Development and evaluation of radiation measurement platforms for resource monitoring network applications. Transfer radiometer calibrations traceable to the World Radiometric Reference scale of measurement using absolute cavity radiometer intercomparisons. Support the seasonal Broadband Outdoor Radiometer Calibration (BORCAL) function of NREL's Metrology Laboratory. Support the outdoor characterization of photovoltaic devices. Implement architectural design for improved Mesa Top facilities to meet increasing needs of research and development. Visit the Solar Radiation Research Home Page for more information. Hourly solar radiation and surface meteorological data base for NREL. Contribute 1-minute data to World Meteorological Organization's Baseline Surface Radiation Network. Annual calibrations of approximately 200 pyranometers and pyrheliometers. Research and development of improved radiometer calibration techniques for DOE's Atmospheric Radiation Measurement (ARM) program. Development of solar radiation resource measurement systems for international applications. Characterization of low-cost radiation measurement systems for utility applications. 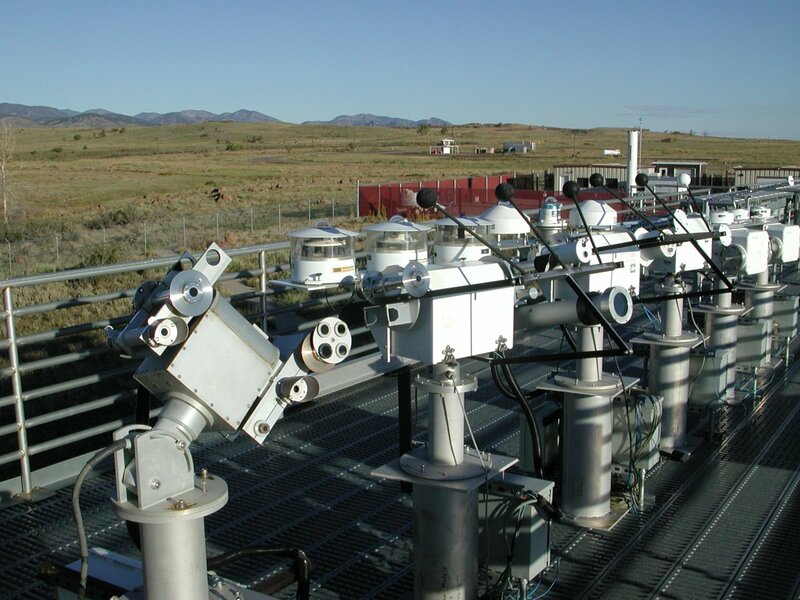 Measurement System (BMS); Golden, Colorado (Data); NREL Report No. DA-5500-56488.